probably one of the more difficult tasks to go around. If you pick a motor that's not waterproofed and then you decide that you need to encapsulate it somehow in order to keep it dry, it's not an easy task." In contrast, it's easy to keep a camera dry, Barrows notes. There are no moving parts between the inside and outside and all you have to do is put enough epoxy around it to seal it off. However, "the problem with most underwater motors is the rotating shaft. So most folks go to some kind of motor that's already been designed to be waterproof. One good selection is a bilge pump motor. It's already been designed to work in a boat." Barrows says that his class typically installs 12- to 36-volt bilge pump motors, "right out of the West Marine catalog. We chop them apart, throw away the impeller, and use hobby shop R/C boat propellers. In the last two years, we haven't lost a single motor." reverse the direction of the motor. Bohm doesn't get mission-specific; the goal is to simply get an ROV with a camera that will get in the water and look around. Barrows says that, if he were rewriting the book, he'd be tempted to add, "a manipulator arm or some sort of tool to do a job." Still, Barrows says that lack of one is okay; the chief objective of many ROVs is to simply look around. As an example, he mentions that, when law enforcement officials need to find a dead body underwater, they typically drop a sonar towfish first (the same underwater device the competition at UC Santa Barbara was built around). Very often, though, it simply returns shadows. "It's very rare that you get a clear enough image to be able to tell that it's a human body, especially if it's been down there very long." Today though, there's an alternative to immediately suiting up a diver to verify sonar. 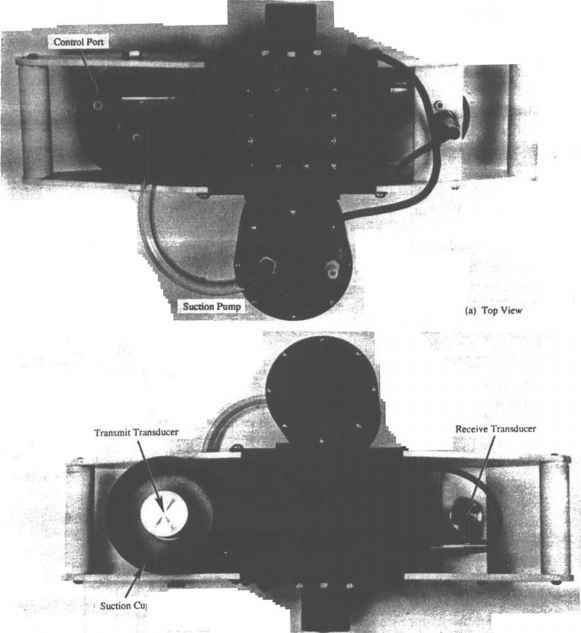 An ROV with a camera is frequently dropped into the water instead. "So, eyeball ROVs are very common. That's the level that Harry takes you to in his yellow book and I would suggest that anyone take a close look at that to see if - maybe just by reading it - you'd be ready for the next level or if, maybe, it's challenging enough to be a first time operation." Student letters testify to the delight of tours by SFU's Underwater Research Lab. Harry Bohm works with a student at an ROV workshop at the Vancouver Maritime Museum. Bohm secures the orange floats used for buoyancy prior to launching an ROV. too big to get out through the small opening. "There were lots of other problems and lots of other failures, but it made us feel pretty good that we could get the job done at all." For this year's mission — held in a UC pool in Santa Barbara — Barrows' team designed two ROVs. "The scenario was that a German submarine had sunk on a coral reef off of Florida and there were toxic chemicals aboard the submarine, in its reservoirs." To make that scenario even more complex, the imaginary researchers who discovered the submarine had lost a sonar towfish — an underwater device that is dragged behind a surface vessel to return a clearer sonar picture to the person who sits behind the sonar's CRT screen in the boat above. Complicating that scenario is another piece of advanced underwater technology: a pinger — an electronic tracking device that scenario imagined was tossed into the water by a member of the ship's crew when their towfish got hung up on the reef. That's one complex scenario! To complete it, the ROV teams had to perform seven tasks. "We had to recover the towfish and the pinger. We had to identify the submarine via its ship's bell that was also on the reef someplace. We had to try to get a sample of this toxic material that was in the submarine's reservoirs. We had to measure the length of the submarine to help identify it and also measure the depth that the submarine was working at. "Oh, and there was a time limit of half an hour." No wonder Barrows' team decided to build two ROVs to tackle it. Even with two machines, though, it ended up being too complex of a mission for any of the student teams to complete. "This year, no one got all seven jobs done. A number of them got four and I think the winner got five." This student-designed ROV took first place at a regional A plastic tub becomes a test tank as teachers try out science fair. It uses PVC tubes and end caps for buoyancy. I the Sea Perch ROVs they just completed.